I'm trying to igure out a way to create this chamfer without doing a sweep. Please see image. I need a chamfer on the edge, between the two points. I can do stop at reference, but can't seem to select more than one point on which to stop. As you see, I need it between two points. I can't seem to find the option for stop cases, either. I'm new to Creo Elements/ Pro E 5.0, but have seven years modeling experience. Thanks in advance for your assistance! I would not say this is a very good solution; But I want to just share some of the Creo/Pro-Engineers Features. I haven't seen the chamfer command do that before, but if a round would serve your purpose you can use that blue curve on your part as a guide for the round. 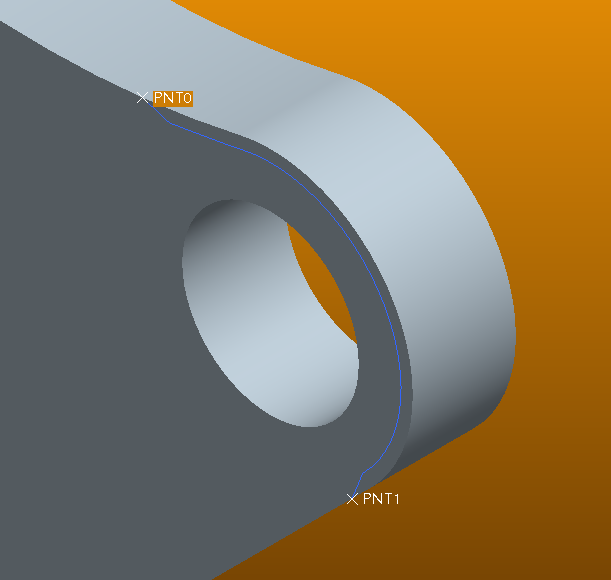 See "thru curve" option within round command. But, a sweep would be the better choice. However, don't use "Sweep" use "Variable Section Sweep". It will give you what you want without the cascading menus. Variable Section Sweep doesn't mean that you have to vary the section. It just an option. That's a good looking background color. What are the RGB values? Unfortunately I need a chanfer, not a fillet. Thanks for the suggestion. That's a blended background. Top color is 248, 153, 6 and the bottom is 84, 46, 2. Really, use the Variable Section Sweep to achieve the chamfer. I believe it to be what the majority of the users here would do. Well, they would use one of the two sweep commands I mentioned earlier, that is. Do you want to chamfer with in certain limits? I haven't had a chance to try this, but as soon as I do I'll report back. Thank you! Nice write-up kshetrabasi. However, I think Kris will need to do a sweep anyways because if he's using some kind of milling cutter, there will be a conical "turnout" at the ends where the tool stops or the tool path interpolates out of the part. Also, to Kevin: Yes, you can use a VSS with a constant section, but I'd really advise using a simple swept feature whenever possible as VSS's make the file size larger and the file more complicated that it needs to be. Now, sometimes a trajectory that SHOULD be good will not work for a sweep, and then you're FORCED to use a VSS or swept blend, but for something as simple as this, I'd certainly use a blend. Another caveat: Avoid using conics in a sketched section if possible too. They're powerful shapes, but can cause issues downstream. In this case, Kris happens to be a "she".